Sometimes an album catches your eye with the pedigree it brings to the party. I’d not heard of Jan Linton, who is the primary artist here, but I certainly knew guest guitarist Leo Abrahms from this album and anyone reading this should know all about Matthew Seligman. His CV is legendary. These three players form the foundation of “I Actually Come Back,” which serves as an art rock [with side trips into pop] coming out party for Linton, who has existed under my radar but travels in very interesting circles. This was probably due to his move to Japan where his guitar prowess has languished under the radar of most people in the Western Hemisphere. But that should change. “I Actually Come Back” is an album of deep technique layers taking a deliberately light approach to the music. While it’s true that the earlier version of this album was sold on Burning Shed, don’t assume that it’s just bloodless prog technique on parade here. If anything, the vocal material here predominates and showcases a subtle, elegant pop sensibility on the part of Mr. Linton. That said, it’s also an album with plenty of EBow action and if you’re as much of a fan of that luxurious and otherworldly sustain as I am, you will also find plenty to love here. Oh, and it’s also only the second album out of thousands in my Record Cell that features fretless guitar, so know that Linton means business! The album opens up with “Kindness [overture]” which sets the tone for the album with a brief instrumental of healing grace with Leo Abrahams supplying guitars while Linton mans the synths. The vibe is not unlike that of the Cocteau Twins with Abrahams’ shimmering guitar textures striking close to the Robin Guthrie target. Way before it ceases to amaze the concise number steps aside for the first of the three versions of the title song on the album. The vocals of Linton appear here and he sounds similar in voice to Thomas Leer, but his phrasing owes more to that of David Sylvian. The gentle, pastoral sound proffered would be less jazz-derived than Sylvian’s solo career, but the EBow of Abrahams and the fretless bass of Matthew Seligman, still give an art rock undercurrent to what is a delicate love song. If anything, it recalls first album China Crisis, who managed to straddle a similar line. My favorite song here was definitely “Joy” which never comes close to feeling like as much as half of its six plus minute running time. It began with a heartbeat rhythm before the beatbox kicked in after the introduction. I could listen to this track all night as Linton comes closer to Sylvian territory and then takes it deep in the art rock zone with his use of fretless guitar. If you’ve not heard it, there’s little else quite like it. The distant, dreamlike guitar tone typifies this album; as if the guitars were being played in a large building several rooms away from where you were listening. This makes for perfect listening in the wee, small hours but could also serve in the morning in a pinch. Abrahams and Linton trade off memorably on “The Kindness of Strangers” over a “Five Years” martial beat with Abrahams offering Guthrie-like peals of sky guitar with Linton playing a harmonica melody to complement him. “Anemone” was an earlier Abrahams’ solo track from the “Scene Memory” album that Linton wrote lyrics for and it became an ethereal song here, though it sported a surprisingly motorik hi-hat rhythm. The album also offered a gorgeous instrumental in “Cocteau Sublime” with a deeply still ambience featuring phased rhythms and nearly subliminal vocals from Linton. Also offered in this package is a CD-3 of the earlier  “Buddha Machine Music” of more abstract ambient work. It provides a contemplative coda to the Occidental near-pop of the first disc in this set. This set, even more than the main disc, hews closely to the ambient post-rock tributaries that one can find in the Burning Shed stable of artists, though this one was initially released by Entropy Records. What is fascinating is that all of the music here has its genesis in the Buddha Machine; a small piece of generative music hardware developed by Christiaan Virant and Zhang Jian but manipulated and composed by Linton. Mr. Linton shows himself to be a potential peer to Monastic favorites like Bill Nelson, Brian Eno, and David Sylvian with this work as be blended guitar, synths, and drum machine, while hitting closer to the pop mark on the vocal material here as typified by early China Crisis. Locally, Continuum Fingerboard synthesist Sally Sparks, hosts world class musicians in her Streamside Studios for intimate home concerts I’ve attended in the past. 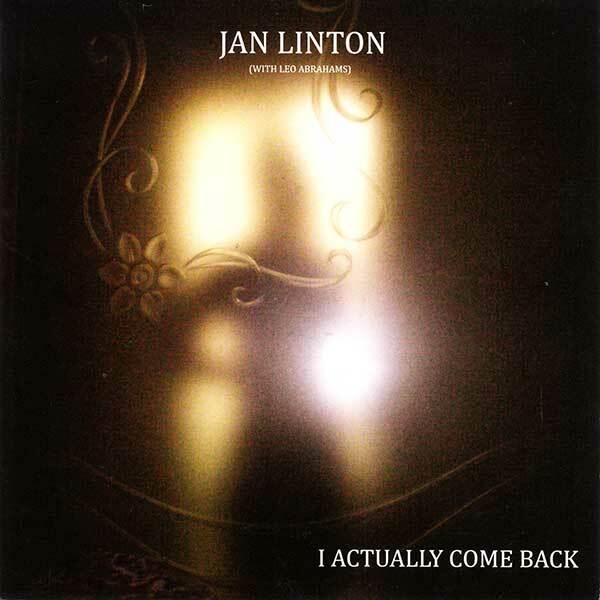 I daresay that Jan Linton would fit the bill at such a show like a fine kidskin glove. Now, if I could only get him the 8,000 or so miles from Hong Kong to Asheville, it would be just perfect. Until then, “I Actually Come Back” can be purchased here. This entry was posted in Record Review and tagged 2018, Jan Linton, Leo Abrahams, Matthew Seligman. Bookmark the permalink. I know Jan Linton from a song from about 15 years ago that was sort of Bowie sings The Dolphin Brothers – The Kindness of Strangers. These new sounds have the benefit of very clean production. This time it certainly feels more like David Sylvian is the reference point with some 80s Bill Nelson. Shenxiaozhong could have been a track on the instrumental side of Gone To Earth.